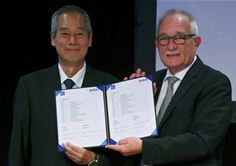 The IEC (International Electrotechnical Commission) and CENELEC the European standards organization commit to further increase alignment between International and European standards. Geneva, Switzerland; Brussels, Belgium; 17 October 2016 – Friday, during the annual IEC General Meeting in Frankfurt, the IEC, which publishes the large majority of International Standards for electrical and electronic devices and systems, and CENELEC, its counterpart at the European level, have signed an agreement that will increase the harmonization between International and European standards. This agreement will benefit the European electrical and electronic industry, which will find it easier to export to markets around the world, many of which rely on IEC International Standards, as well as manufacturers from other countries who will be able to export assemblies and products more easily into the European market. Today, electrical and electronic devices are the largest category of goods traded in the world. In 2015, they represented 17.7% of total trade value, according to UN Com trade statistics. This is without counting goods such as lighting, photographic devices, aircraft and trains, which are not included in these numbers. Europe is an important consumer of electrical and electronic devices and systems and is host to thousands of small, medium and large companies active in this field. Many of them want to sell beyond national and European borders. Around 80% of all European electrotechnical standards are identical to or based on IEC International Standards. This level was achieved through the Dresden Agreement which was signed in 1996 between both organizations. However, a lot has changed since then – global trade in electrical and electronic devices has accelerated and differences between products have become a lot smaller. The new Frankfurt Agreement takes these changes into account, and aims to bring the ratio of harmonization between International and European standards up to an even higher level. Under the Frankfurt Agreement, the primacy of electrotechnical standardization at the international level in the IEC will be reinforced. This avoids duplication of efforts and helps make best use of European and IEC experts. Also new is the fact that CENELEC will start including the IEC acronym in the designation of all European standards that are identical to IEC International Standards to increase transparency and facilitate content traceability. The IEC (International Electrotechnical Commission) is the world’s leading organization that prepares and publishes globally relevant International Standards for all electric and electronic devices and systems. It brings together 169 countries, representing 98% of the world population and 96% of world energy generation. More than 20 000 experts cooperate on the global IEC platform and many more in each member country. They ensure that products work everywhere safely and efficiently with each other. The IEC also supports all forms of conformity assessment and administers four Conformity Assessment Systems that certify that components, equipment and systems used in homes, offices, healthcare facilities, public spaces, transportation, manufacturing, explosive environments and during energy generation conform to them. CENELEC (The European Committee for Electrotechnical Standardization) is officially responsible for standardization in the electrotechnical field at European level alongside CEN and ETSI. CENELEC provides a platform for the development, adoption and revision of European Standards and other deliverables in the fields of electricity, electronics and associated technologies. CENELEC works in partnership with the International Electrotechnical Commission (IEC) to coordinate their respective activities and enable the alignment of European and international standards. More than two-thirds of all CENELEC standards are identical to IEC standards. The members of CENELEC work together with various stakeholders from 33 European countries, including industry, SMEs, societal stakeholders, public sector bodies, academics and researchers, to develop voluntary European Standards and other deliverables. Likewise, it cooperates with the European Commission to develop and adopt harmonized standards and other deliverables that support the implementation of EU policies and legislation.